Pottery clay is the raw material that has made sculptural ceramics and pottery possible from pre-historic times. Ceramic clay is a mixture of alumina, silica and water, made from weathered and degraded feldspathic rocks. 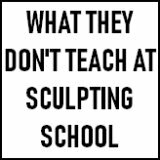 What does this mean, in practical terms, for you and your sculpting development? Well, first of all it must be remembered the differences between art pottery clay (for throwing, hand building, art pottery and rough sculpture), and the type of ceramic clay needed for fine, highly detailed sculpture (like the work I mainly produce). My modeling clay can be fired, but it's primary role is fine sculpting capability. The most important thing about pottery clay is that it is ‘plastic’. In other words it can be molded, bent and shaped without cracking, and can hold its shape. 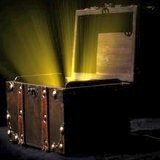 The actual content is mainly very fine-grained silica, alumina and water. The more silica the more plastic the clay. Pottery clay particles are flat and support each other when moist. 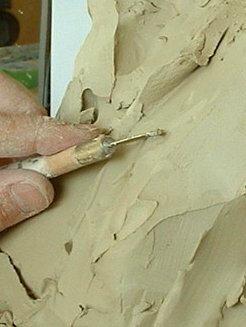 Moist clay is often called ‘plastic’. Clay that has hardened off from the plastic state, but is still workable and moist, is referred to as leather-hard. Dried out clay can be known as greenware. There are three categories of pottery (or ceramic) clay: earthenware, stoneware, and porcelain. Earthenware is fired at the lowest temperatures and is therefore the most economical to produce. Earthenware types include faience, delft, and majolica. After firing Earthenware remains porous and never becomes translucent. It will liquefy at hot temperatures. Stoneware is fired at higher temperatures, and can become vitrified (non-porous). Jasperware and basalt ware are types of stoneware. Stoneware is never as translucent as porcelain. Porcelain china is fired at high heat, and the result is a vitrified, translucent, white pottery. Although these are the three basic categories of clay, you will hear people refer to different types of ceramic clay, using words such as kaolin, feldspar clay, terracotta, ball clay, fire clay, glacial clay, marl clay, raku and bentonite etc etc. These different names for clays are indicative of their uses, origins and appearance, and each fits into one of the above three categories of pottery clay. For example, iron oxide (rust) makes a red pottery clay, sometimes known as 'terracotta’ and normally refers to red earthenware. Kaolin is another word for china clay which is an essential for the manufacture of porcelain and bone china (a type of porcelain with bone ash added). As a general rule, the more impure the clay, the more coarse its end product will be (e.g. bricks). Conversely, the finer the material, the finer the product (expensive tea services etc). China clay is found in great quantities in Cornwall, England and also Malaysia. Feldspar clay (aka petunse or petuntse), is the aluminum silicate component of porcelain. It vitrifies to give the translucent glass-like appearance of porcelain. Feldspar was referred to by the ancient Chinese makers as the ‘flesh’ of the pottery clay. Although for years was the missing ingredient the Chinese kept from the European makers, feldspars can be found in many types of sedimentary rock the world over. Petunse or petuntse was the original mineral in which it was found. The clay I recommend for sculpting on the tutorial pages is called Potclays 1150 is essentially stoneware with a high ball clay content. If you use this clay and want to fire it, beware of the drying process, because, as a general rule, the easier the clay is to sculpt with the more trickier the drying and firing process becomes. Ball clay is the general term for a certain type of highly plastic clay. It has very fine particles and tends to fire to lighter colors. Ball clays have a high shrinkage rate and can cause items to warp and crack while drying and in also the kiln, so here are a few pointers about the drying process. First, ensure the ware is hollowed to an even thickness of no more than 1 inch, then let dry completely before firing. The alternative is to slab build, depending on the piece. 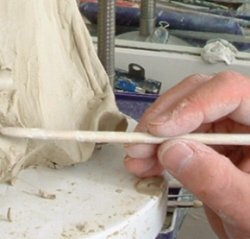 There are other methods to ensure an even thickness for firing and they are described in detail by potter Andrew Werby in his article for Wetcanvas.com. Do not hurry the drying process! Dry the 1150 piece slowly on a slightly moist plaster of Paris bat partly covered with a plastic bag. The hotter the weather, the more careful you have to be. Over several days, gradually move the bag further up the piece allowing a bit more air to circulate each time. The plaster bat gradually dries out with the 1150, but obviously extending the drying time. You can't hurry love! Ball clay is a very fine ceramic clay. The name derives from the old method of cutting the clay from the floor of an open pit. It came out of the ground in square lumps, but the corners would be removed in the handling resulting in a ball shape. Ball clay is not common and important deposits are found in Devon and Dorset. Like china clay, ball clay contains a large proportion of kaolinite. However, china clay particles are much coarser and so, unlike ball clays, china clays are not really plastic enough for sculptural ceramics. Sculptors like me use clay as an intermediary step, making a sculpture from which a mold can be made. 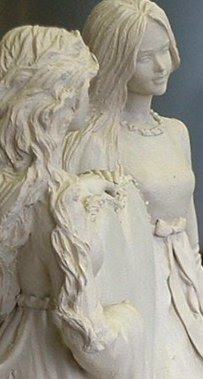 Others, like fellow UK artist, Heather Coleman (see sculpt above) use it as their final medium, firing the original piece. It is always a difficult process to find the right balance between clay which has superb modeling qualities like Potclays 1150 and a clay which behaves well in the drying process and the kiln, which might not have the same modeling qualities. If a sculptor wishes to use the same method as I use, in order to be able to cast multiple pieces from a mold, a clay "slip" is poured into the plaster mold, left to build up a layer in the mold cavity, and poured out, leaving a hollow shell which is left to dry some more, then removed. The resultant forms can be assembled to make quite complex composite objects, like the famous figurines of Royal Doulton and Coalport. Return from Pottery clay to homepage or alternatively go to the clay sculpting page.